Yesterday afternoon, the Tweeny Bookworms met to discuss THE MOTHER-DAUGHTER BOOK CLUB by Heather Vogel Frederick. All of the girls seemed to like (or even love) the book, and I was very surprised by how anxious they were to talk about it. I really think THE MOTHER-DAUGHTER BOOK CLUB was a wonderful books to discuss with middle grade girls because all of them were able to relate to it on some level. We had some really great discussion about mean girls and how to handle their actions, as well as how terrific it is to have friends that are different from you. Without a doubt, the highlight of the meeting was when we called the author, Heather Vogel Frederick. This was the girls' first author chat but I have a feeling it won't be the last. Ms. Frederick opened up the discussion by talking about her career as a writer, how (and when) she knew that she wanted to write books, and how The Mother-Daughter Book Club series got started. Then she opened it up for questions. I would have sworn that the girls would have been to shy to ask questions, but I would have been very wrong! Almost every girl asked at least one question! And the quality of the questions was outstanding -- keep in mind these girls are 10 and 11. For example, one girl asked her if she was inspired by books that she's read, one asked her for her favorite authors, and one asked her for advice for young writers. I can't rave enough about how wonderful Ms. Frederick was with the girls. I will never cease to be amazed by how nice authors are to take time from their busy lives to talk to book groups about their books. I think the girls (and the moms) will always treasure the opportunity to talk with a real live author! And personally, I was thrilled to learn that there will be a fifth book in the series where the girls read The Betsy-Tacy books! 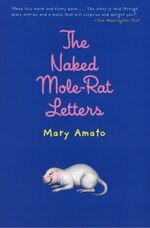 Next month, we are reading THE NAKED MOLE-RAT LETTERS by Mary Amato. I am not familiar with the book, but when it was announced, Booking Daughter and her friend went nuts! They both read it in 5th grade and loved it. Since I respect their opinion on books, I have to say that I'm looking forward to this one! The description isn't too detailed, but it's just enough to make me curious. It sounds like there might be the potential for some great discussion. There's going to be a fifth MDBC book??? yay!!! and on Betsy Tacy? does BookClubGirl know this yet?! I'm sure the girls were on Cloud 9 after that book club meeting! What fun! Daisy daughter devoured all three books and we are waiting for Pies and Prejudice in the mail! And a 5ht?? Woo hoo! We meet tomorrow night...haven't heard much about what the other girls in our group think (or Moms either). Of course, your Tweenies are a tad older than our group...so the mean girl stuff and the name calling surprised and bothered me. But Daisy daughter and I discussed it, so I'm much more accepting of the book now. I will report tomorrow! Speaking of Betsy/Tacy -- I noticed on Amazon they are re-releasing several of her other books on Oct 10th!! I love that you have this book club! And I'm very intrigued by The Naked Mole-Rat Letters. Sounds like a huge success. Wow!!! Between great book, super-awesome author chat, and yummy baked goods, the meeting must have been unforgettable. Would be happy to skype or chat after you read The Naked Mole-Rat Letters.